A sweet jRPG-style game about cats, brutal massacres, cuteness, racism and social issues, friendship, sinister thoughts, hilarity and Nazi furniture. It’s an epic attempt to blow your mind with adult themes hidden behind bright cartoon graphics. Positive (35) - 97% of the 35 user reviews for this game are positive. SAVE 40% OFF! Get our bundle (8 games)! 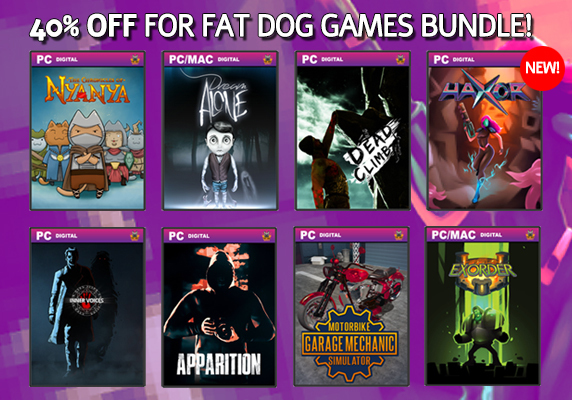 Recently we added a brand new game to our Fat Dog Games bundle. Haxor is its name and retro is its game! Relive your nostalgic past with a pixel heavy, old school platformer filled to the brim with bosses, rocket jumps and phat chip-tune music! Every purchase comes packed with the Haxor ambient soundtrack! The bundle is 40 OFF for a limited time! 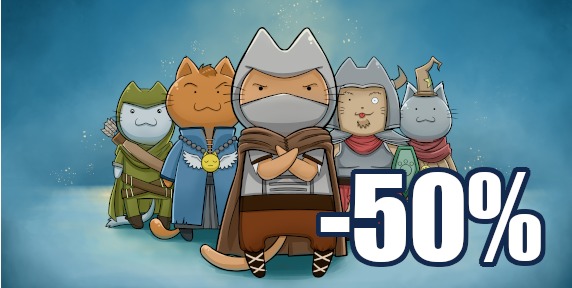 The Chronicles of NyaNya are 50% off now! Thrilling like a payday, a story of cats in funny costumes that do RPGish things. It is full of many unexpected and incredible twists, the tragedies of an individual lured into the trap of an adventourist internship, and friendly pastry, which is very sensitive to nihilism. The game also contains many thrilling conversations, walking around the map with some logical puzzles sprinkled in here and there – but don’t worry, even a liberal arts student should be able to solve them – raising pastry, and deliberations about important moral and existential issues, the majority of which will affect the ending you get. The ending will sum up the fates of the most important characters, in-game achievements, your proficiency in fighting the ultimate bad guy, your finesse in raising pastry and the degree of faith in friendship. This results in dozens of possible ending combinations. After completing the game, you can try NewGame+ to unlock additional, normally unavailable skills for the main character. Nyanya is an enormous cat world that can take up to 20 hours to fully explore. The main plotline itself is good for more than 8 hours of fun, but the game also includes many side quests found on numerous maps, hundreds of interactions with NPCs and over a thousand descriptions of nearly everything. You can also find dozens of exciting items such as the legendary Excalipurr and the frightening Berserker Catnip. The role of the majority of animals is played by various kinds of rolls, which, together with cats, pidgins, and sneks, constitute the entirety of Nyanya’s fauna. Kibble is found in mines and on can triis, almost all buildings are boxes (because cardboard boxes are cats’ natural habitat) and cleaning fur is a matter of importance to the state. The sense and logic of this world are therefore highly debatable... But don’t worry about its coherence. We made sure that it is top-notch. a giant stone leg, whose calf disappears in the clouds, Meowrida the Brave – goddess of shooting, and Overcat – the creator of everything that's feline. The game is produced in a retro jRPG style. The protagonist of the game is Catair, a meowsassin, who is as optimistic and sweet as sandpaper. When she sets out on her amazing journey, she has the chance to discover friendship, love, and revenge and to travel through many wonderful lands that she does not want to visit... And yet, she has no choice. a fighter for friendship and even more friendship, as well as meowmage Meowdledore, whose parents bought him gifts instead of giving him some attention. You can meet them here. The game features tons of epic turn-based jRPG fights, where you will have an opportunity to use dozens of such unique cat techniques as Boot to the Head, Slipper Comet or a Hairball of Darkness. The characters represent traditional classes such as meowsassin, meowmage and purrior. With their powers combined, they are able to face adversities such as student internships and unpaid overtime. Among the dozens of opponents, you will find monstrosities such as orcats, aggressive cat fetuses enchanted in slime, or Purrevar, Prince of the Underpurr. What is more, The Chronicles of Nyanya is probably the only game in which you can charge Nazi furniture on your rollicorn or fight their mysterious Wundermöbelwaffe. The game is filled with familiar-sounding places and names. If you love comic books, memes or just pop culture in general, you will feel right at home in Nyanya. You will meet Cateris, talk with Granny Weathercat, Furry Catter and Nyoda and listen to the moving stories of Catmerian guards, who always wanted to be adventourists like you, but they took an arrow to their knees. In other games, references are Easter eggs, in Nyanya they are the main course. The game was created by hamstercube studio, made up of Ilona, author of chatolandia and Adrian. The graphics were created mainly by Revv, known from her Tak bardzo źle blog; Ilona also had something to do with it. The moving music, which tickles your aesthetic sense was composed by Marcin Maślanka, an experienced composer of soundtracks for games and films. 11 Curators have reviewed this product. Click here to see them.